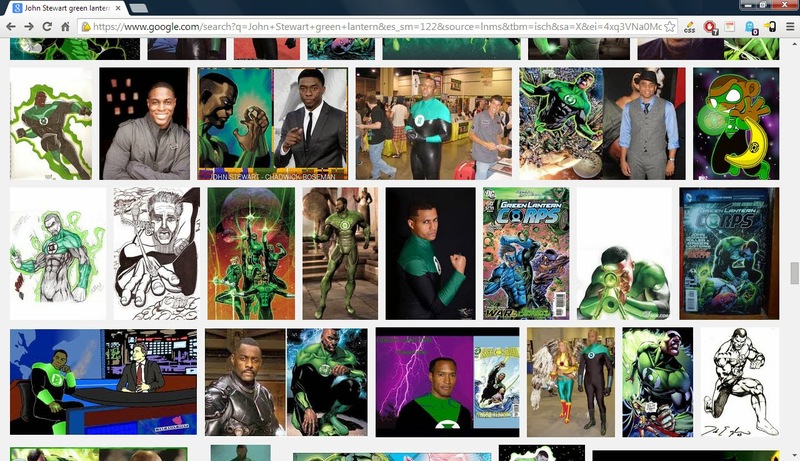 You ever do a Google image search for "John Stewart Green Lantern"? (You have to include the GL part or else you get pictures of comedian/The Daily Show host Jon Stewart.) The first 15-20 images are from various DC comics and cartoons. 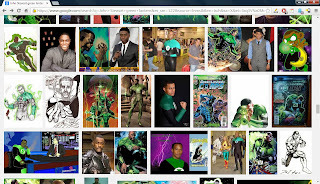 And while the pictures after that continue to include official DC images, the results are quickly overwhelmed with fan art and cosplayer photos and a variety of Black actors with GL costumes Photoshopped onto them. Now try similar searches with other heroes: Superman, Batman, Wonder Woman... You have to scroll and scroll and scroll before you get more than a couple pieces of fan art or cosplayers. It's almost all official pictures. Drawings by Curt Swan, Neal Adams, and George Perez; photos of Christopher Reeve, Christian Bale, and Lynda Carter. There are two possible explanations. First: Superman, Batman, and Wonder Woman are more popular characters. DC is producing more content to feed that popularity, so it stands to reason that more official images of them exist to be searched on. Second: Superman, Batman, and Wonder Woman are seen, by both DC and fans, as solid characters in and of themselves, owned wholly by DC. John Stewart, on the other hand, is seen as more aspirational by fans. Not just in the sense of a character to live up to, but a character that truely represents them. Or, probably more accurately, a character that represents that aspirations of an entire race. It's not just "if I work really hard, I can become more like Batman" but "if we all work hard, Black people can collectively rise up to the level of Green Lantern." I suspect the truth is something of a blend between the two. Regardless of where the answer falls along that spectrum, it points to a huge opportunity DC seems to be largely ignoring. There's clearly a very passionate fan base for John Stewart. Not as large as Superman's fan base, admittedly, but still very passionate. More to the point, John Stewart's fan base is one that is not being well-served right now. Not by the comics arm, nor the television arm, not the movie arm of DC. Fans are essentially left to create their own content around John Stewart because there simply isn't that much of it coming from DC itself. DC is including the frickin' Atom on TV and they can't even have John Stewart cameo on Arrow?!? Isn't all of this the same as DC leaving money on the table? There's a website called Has DC done something stupid today? that does nothing beyond count the days since DC had a significant public gaff. Personally, I think it ought to sit at "0" every day until John Stewart is given fair props with his own comic title, or gets regularly featured on a TV show or movie. Meanwhile I'm tempted to argue that, in addition to everything else this represents, it's a further argument that popular culture should not be locked up forever as exclusive corporate property. Audiences created Superman, Wonder Woman, and yeah, Green Lantern--at least as greater phenomena--as much as did DC and various WFH employees. The people should have a greater say on what direction(s) those popular phenomena take, at some point at least, instead of being formally restricted to a perpetual consumer role. But for now most people seem content with that, and so everyone else is just out of luck.